1. Tap on Apps from the Home screen to get started. 3. Tap on Private Mode under Settings to proceed. 4. 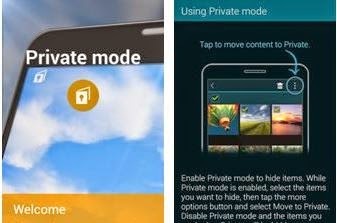 Tap the Private mode switch to turn it on or enabled. 5. Enter your Private mode PIN. 6. To disable Private mode, tap the Private mode switch to turn it OFF, and then tap OK to deactivate the feature. 3. Under Settings, tap on Private Mode. An alternative method for this is through opening the Notification panel or Quick settings panel, and then tapping on Private mode to activate the feature. 4. When prompted, read the on-screen information and tap Next to continue. 5. View the type of content that can be saved in private mode, and then tap Next. 6. When prompted, read the on-screen information on how to use Private mode, and then tap Start. 7. Set up and assign an unlock code and backup PIN. showing on the indicator bar. 8. Now choose the items you want to mark as Private, while using Private mode. 9. Once you're done selecting all the items to be tagged as private, tap on the More button, and select Move to Private. Doing so will then make the selected items hidden to other users when Private mode is disabled. You will know that an item is hidden when you see the private mode icon on them. To hide the items you've selected, get to Apps, tap on Settings, select Private mode, and then drag the Private mode switch to the left. Another way is to open the Notifications panel or quick settings panel, and then tap on Private mode to deactivate it. All the selected items will now disappear from the screen. 1. Select the item(s) you want to remove from private mode. 2. Tap on the More icon (three-vertical-dots icon) on the upper-right corner of the screen. 3. Select Remove from Private. The selected item(s) will no longer be hidden or secured, thus viewable by other users of your device. All the items you've added in private mode should now display on the screen. And that concludes this guide on using Private Mode on Samsung Galaxy Alpha.